All United Solar products are based on a sophisticated multi-layer amorphous silicon thin-film solar cell developed originally by Energy Conversion Devices, Inc. This spectrum-splitting cell, shown schematically at the right, is constructed of three separate p-i-n type, amorphous semiconductor solar sub-cells, each with a different spectral response characteristic. In this way, the cell can convert the different visible and near infrared wavelengths of sunlight with optimal efficiency. The United Solar spectrum-splitting multijunction design now holds all the world's records for amorphous silicon solar cell efficiency, including the highest stable efficiency measured by the National Renewable Energy Laboratory (NREL) for a small-area amorphous silicon solar cell -- 13 percent. 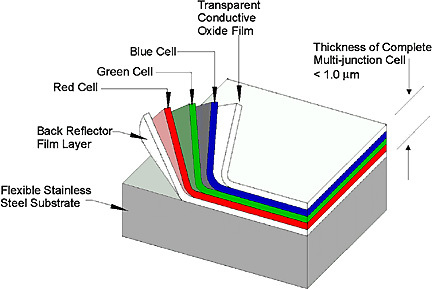 The United Solar thin-film cells are manufactured in a unique continuous roll-to-roll deposition process. 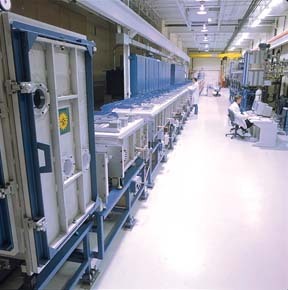 Each of the nine thin-film semiconductor layers that comprise the cell is sequentially deposited in separate, dynamically-isolated, plasma enhanced chemical vapor deposition (PECVD) chambers as the stainless steel substrate progresses through the machine. The company's new manufacturing plant, shown at right, has an annual production capcity of five million Watts of solar cells. The thin-film materials, cell designs, and manu- facturing processes used by United Solar Systems Corp. are protected by more than 160 issued U.S. patents.